The final results from today's race can be found here: http://www.tristarlive.com/rankingstrstnv. Congrats to all of the triathletes!!! You are all winners!! PRO Amy Kloner (USA) is the first female finisher for TriStar111 Nevis in a time of 4:08:01. Congratulations!! Congratulations to the top 3 men finishing the TriStar111 in Nevis today! Congratulations are in order for Olivier Marceau (SUI) for winning TriStar111 Nevis in a time of 3:48:26. Marceau took 2nd in 2011 with a time of 3:49:14. Patricia Morris (CAN), our oldest female triathlete, is now on her second leg of the bike course. Her latest split time is 3:23:09. Keep pushing!! The jubilant cheers of some of the youngest fans greet today's TriStar athletes as they cross the finish on South Hunkins Drive in gorgeous Nevis. The triathletes are nearing the end of the bike course. Here is a look at the course for the upcoming 10KM Run. Nevis’ Deputy Premier and Minister of Sports Hon. Hensley Daniel made a special visit to TriStar Nevis this morning. He caught up with recent finisher and famous French actor Paul Belmondo. On behalf of Star Events, we thank you Minister Daniel for your support! Congratulations to today's Top 3 in the 33.3! After a week of coaching sessions with TriStar athletes, Coach Shaun Green (GBR) shares his excitement for first-time triathlete at age 63, Patricia Morris (CAN) competing in TriStar111 Nevis today. He first met Patricia during a transition clinic mid-week. "I want to hi-5 her at the finish line! Bless her!" says Green. Here are the first set of split times from the first stage of the TriStar Nevis 111. Gentlemen and Ladies start your engines!!! The Avery family of the UK have found a dear bond through triathlon. Dr. Avery Gordon (pictured below) is today's oldest competitor at age 79. He shares the race course with his two sons, James and William. Dr. Gordon and his wife Penny moved from the UK to Nevis where Dr. Gordon teaches Epidemiology to local students. On holiday, their sons James and William unite in Nevis for a weekend of triathlon fun! Yesterday, we welcomed the brothers at athlete packet pick-up. Watch for Will (Bib 15) to cross the finish line in the 111. Look for James "Jaybird" (Bib 306), to cross the finish in the 33.3. GOOD LUCK to the Avery family! Yes you can! Today, we caught up with Star Events Ambassador, famous French actor and former Formula One driver Paul Belmondo as he arrived into Nevis this morning. A frequent visitor to the Caribbean for 30 years, Paul was eager to race in Nevis for the first time in TriStar 33.3. In fact, this will be his first race outside of Monaco! "With TriStar, I always know the locations and options are among the best in the world. When you can combine sport with triathlon and bring the entire family, it becomes a really special social experience," said Paul. When asked about the TriStar race course, Paul advised participants to "take it easy and very slow especially in the heat." Combined with lush nature, colorful buildings and wildlife that can appear on course at any given moment, the Nevis bike and run course will challenge the best of the field. We look forward to seeing Paul's results tomorrow as he looks to use this race as a training for TriStar Cannes at the end of April. PRO triathlete John Hirsch wasn't kidding when he said, "This week I've found Nevis to be one of the friendliest and most supportive communities I've ever visited." The Nevis community has shown an outstanding level of support for TriStar Nevis and visiting athletes. Race day is in good hands because of their efforts. Today, the finishing touches were placed around town. The “Queen of Caribes,” Nevis island, is staged for the first TriStar race of the season Saturday, March 31, 2012. TriStar 111 and 33.3 individual and relay races return to the island after an inaugural launch in March 2011. Designed to offer a destination filled with sports, recreation and fun, TriStar Nevis opened the week with a sold out StarMile, a 2.5 mile channel swim from St. Kitts to Nevis. Daily, professional triathlon coach Shaun Green of UK based Green Coaching worked with athletes during custom training sessions in water and on land to offer participants a better understanding of the challenge to follow on race day. Mid-week brought the return of the Pink Lily charity 5K, walk/run from Four Seasons Resort to Pinney’s Beach. The jubilant crowd attracted a mix of local Nevisians, resort visitors, cancer supporters and cancer survivors. And for many visiting TriStar athletes like World Champion Olivier Marceau, Amy Kloner, John Hirsch and Christine Lynch, the charity 5K brought the chance to learn more about the island, the people and the spirit of the Caribbean. “This week, I’ve found Nevis to be one of the friendliest and most supportive communities I’ve ever visited,” said PRO John Hirsch. “The Pink Lily 5K gave me and others the opportunity to engage sport with important charity efforts.” “I participated in the StarMile 2.5 Cross Channel swim on Sunday which was extremely tough but everything worth doing is! 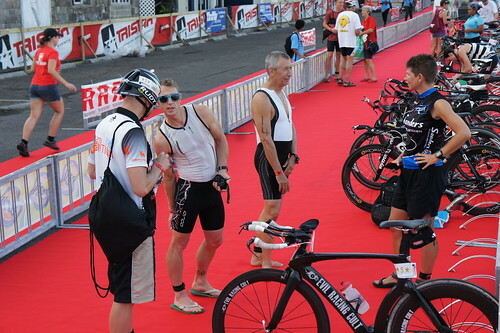 It was a good starting point for my personal race preparation and it launched the week of TriStar activities superbly. 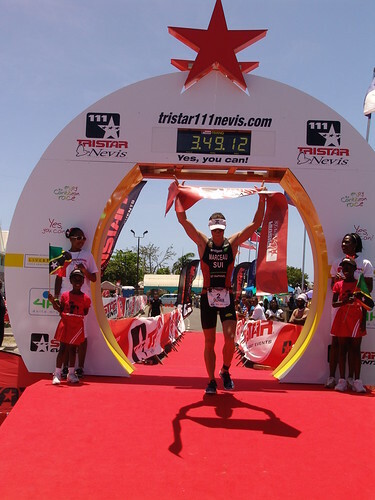 To have such a good event on the first weekend, activities throughout the week and a choice of race distances the second week, TriStar Nevis is a perfect place to kick start your season,” said Shaun Green, professional coach. Approaching race day with a warm forecast of 84 degrees, TriStar Nevis welcomes athletes from over thirteen countries ages 15 - 79. The roster will see representation from Antigua, Barbados, France, Netherlands, South Africa, UK, USA and more. New in 2012, PRO athletes will compete for a $10,000 PRO cash purse. Male PROs include World Champion Olivier Marceau (Switzerland) who took second to Chris McCormick last year, James Weeks (St. Kitts & Nevis), John Hirsch (USA), Reginald “Reggie” Douglas (St. Kitts & Nevis) and Kellen Hood (USA). The female PRO field is represented by Amy Kloner (USA) and Lauren Wassner. Coming up: TriStar Nevis Live Coverage this weekend! Welcome to the TriStar Nevis 2012! The next live Event covered on TriStarLive.com will be TriStar Nevis this weekend!